Geo Themes are increasingly popular since they provide geo location, geo tagging, proximity search that enhance user interaction to build your own money making website. Geo location WordPress Theme can be the best option for showing restaurants, news, houses, rental units, houses for sale, real estate business, events, businesses, shows, parties, popular travel destinations or any type of business that is located on a map. This will allow users to easily view business on a map in relative to their current location and provide ratings and reviews for the businesses. 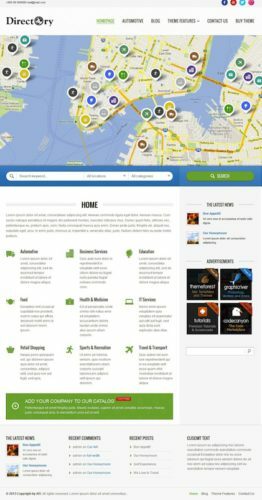 Below are the best Geo location WordPress Themes that I’ve found. Easily create a site like Yelp.com or even a website like 411.com. Please check back because I will continuously update this page as I find more. Let me know if you find some and I will add it. Thanks! 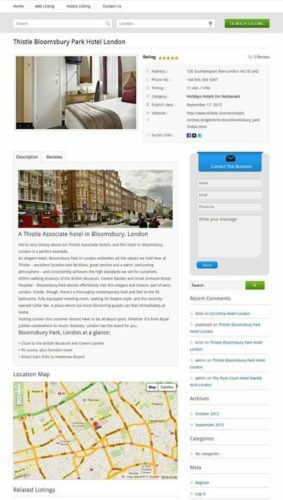 City Guide is a complex and professional WordPress Theme designed to create a site like Citysearch or Yelp. The frontpage has a big map with markers and all the establishments that are in that area. The markers are colour coded to the category the establishment belongs to. You can filter and search the geo guide using the city search checkboxes or directly type in the establishment’s name in the search box. Each city listing has it’s own page where visitors can leave comments and rate using the star system. There are tons of smart locations, with unlimited city directories. You can log the total number of visitors from each city with their IP addresses. The best part is that this site is self sustaining. Users can create their own city listing with descriptions and addresses. You can set a price to charge for different categories and accept payments when you install the WooCommerce plugin. WooCommerce will easily transform your site to an eCommerce ready website. It has all the features needed for eCommerce such as email, payment gateways, inventory, and reporting management. Click here to see more features of City Guide WordPress Theme. Use City Guide WordPress Theme to create your CitySearch website. Wordpress and WordPress themes are the easiest way to create a site. You don’t need to have any programming knowledge or install any additional plugins. This is a child theme of Directory, so you do need the Directory theme to install his city guide theme. Click here to see Directory. Once you install and activate the theme, all features will be as you see in the demo. City Guide is also a responsive theme which means users can view your site from their iPhone, Smartphone or tablet device. The content, navs, and images will all wrap or shrink to fit the width of the screen without compromising font size. You can test out the responsive feature by playing around with the demo and resizing the window. There are tons of features in this theme, see below. Startup Cost to make a location-based site with WordPress and WordPress Theme – Explorable is less than $100. I’ve listed the cost breakdown below. Wordpress is the best and easiest way to get your website started. 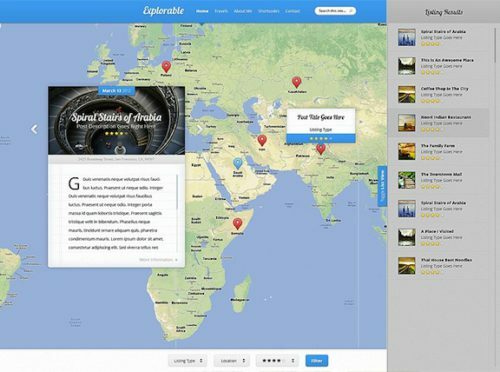 Explorable is a premium WordPress Theme that uses a map as the front page of your site. You create posts and listings and they are plotted onto the map. When the locations and listings are plotted to the map, users can see pictures you took, ratings and reviews you gave each location and read more about the attraction if they are interested. This makes Explorable an excellent way to create a travel blog, travel website, geo theme, local business directories, travel guides, site like yelp and more. Explorable WordPress Theme has some very notable features. 1. Explorable is fully responsive and works beautifully on any mobile device. The website content wraps to fit the viewing screen. You can test the responsiveness by resizing the window when you check out the demo. It will work on any smartphone, tablet or any computer screen. 2. Each listing is assigned a physical location on the world map using the Google Maps API. 3. Explorable has a very sophisticated ratings & reviews System. 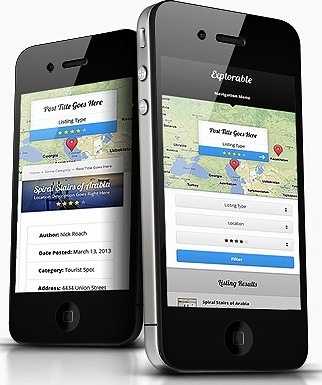 You can rate each location and visitors can also leave a comment and rate the attraction using the star rating system. 4. Visitors can filter locations with the advanced filter. Visitors can filter the listings on the map with the advanced filter at the bottom. They can filter by listing type, country location, and star rating. There are many more features in the Explorable WordPress Theme. Click here to see more features of Explorable. 1. $56 for Webhosting. To create your Travel Website, you will first need a domain name. That’s why I recommend Fatcow.com. When you purchase web hosting from Fatcow, you get a free domain name. Along with that you also get unlimited email, disk space, bandwidth, MySQL databases, host unlimited domains and more. Click here to immediately save 40% off at Fatcow.com. 3. 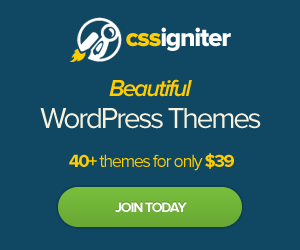 $69 for Wordpress Theme. This is a one time fee to join ElegantThemes. Once you join ElegantThemes membership you have unlimited access to download over 80+ WordPress Themes including Explorable. 4. -$175 in Advertising Credits. If you purchase your webhosting from Fatcow.com you get free $175 worth of advertising credits. Fatcow.com understands it’s difficult to advertise a Travel Site and so they give you free advertising credits, this includes $100 for Google Adwords, $50 Facebook ads, and $25 for Yahoo/Bing. So you actually don’t pay anything to startup a Travel Website. Cost to create your own online directory portal like CitySearch, Yelp or an online Business Listing is less than $100. I’ve listed the cost breakdown below. I recommend to use WordPress because WordPress is easy to use, easy install and easy to change the look of your site. It’s very intuitive to setup and you do not need any programming knowledge. You just click a button to upload the Directory WordPress Theme, then click another button to activate it. 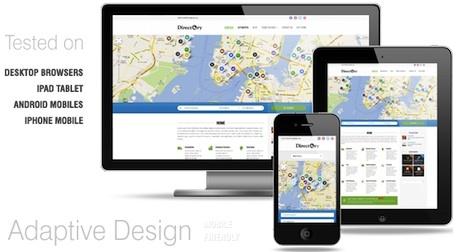 In an instant you have transformed your normal WordPress blog into a responsive GEO Directory website portal. Directory has built in spaces for advertising, you can include your google adsense or any other ads. Google maps is on the frontpage where you can map all your company listings. Users can easily filter by the type of company they are looking for. Click here for more features of Directory WordPress Theme. 1. $56 for Webhosting. To create your own Directory Website, you will first need a domain name. That’s why I recommend Fatcow.com. When you purchase web hosting from Fatcow, you get a free domain name. Along with that you also get unlimited email, disk space, bandwidth, MySQL databases, host unlimited domains and more. Click here to immediately save 40% off at Fatcow.com. 3. $55 for Wordpress Theme. This is a one time fee to purchase Directory WordPress Theme from Themeforest. After you download the theme, it totally belongs to you. There are no subscription fees, no membership fees and no hidden fees. 4. -$175 in Advertising Credits. If you purchase your webhosting from Fatcow.com you get free $175 worth of advertising credits. Fatcow.com understands it’s difficult to advertise your Directory Site and so they give you free advertising credits, this includes $100 for Google Adwords, $50 Facebook ads, and $25 for Yahoo/Bing. So you actually don’t pay anything to startup your Directory Website. Directory Theme uses wide impressive multi-layer slider that can be used on any page. Theme has responsive design, easy to use on desktop, tablets and mobile phones. Powerful and Easy to use admin allows you to set up slider, background, logo, reorder sections, choose from unlimited colors, different portfolio layouts, custom post types, custom widgets and tons of shortcodes. Theme is also SEO optimized and translation ready. It includes everything you need to build a corporate/business portal that will sell. The only thing that is pending is the Ratings & Reviews. This feature is in the planning stage and is yet to be developed into the website. For now the directory is the main feature of this Directory website. I think that getting all the businesses loaded into your website is the important step. The ratings & reviews can wait until you have all your businesses in place. This is a great WordPress Theme to create your own Online Directory Portal like Yelp or CitySearch. Openhouse is a very powerful and flexible Real Estate theme. It will cost you less than $100 to create your own property management website and I’ve listed the cost breakdown below. It includes a very powerful and flexible Search, where you can search by location, number of baths, beds, max price, min price, and property type. The Location search alone is unique in that you can have multiple levels of locations. The theme has features not seen in any other theme, like search results “Google Map”, “Compare”, “Google Street View”, and more. This theme also includes a fully featured Loan calculator which can be shown or hidden in Theme Options. You can use this WordPress theme to create a website like Remax.com, website like MLS.com, site like Realtor.ca, or site like Century21.ca. This is a perfect theme for property managers, real estate brokers, real estate agents and other property management websites. Click here to see more features of Openhouse. 1. $56 for Webhosting. To create your own Professional Real Estate Website, you will first need a domain name. That’s why I recommend Fatcow.com. When you purchase web hosting from Fatcow, you get a free domain name. Along with that you also get unlimited email, disk space, bandwidth, MySQL databases, host unlimited domains and more. Click here to immediately save 40% off at Fatcow.com. 3. $50 for WordPress Theme. This is a one time fee to purchase OpenHouse WordPress Theme from Themeforest. After you download the theme, it totally belongs to you. There are no subscription fees, no membership fees and no hidden fees. 4. -$175 in Advertising Credits. If you purchase your webhosting from Fatcow.com you get free $175 worth of advertising credits. Fatcow.com understands it’s difficult to market your new Real Estate Website and so they give you free advertising credits, this includes $100 for Google Adwords, $50 Facebook ads, and $25 for Yahoo/Bing. So you actually don’t pay anything to startup your Real Estate Site. 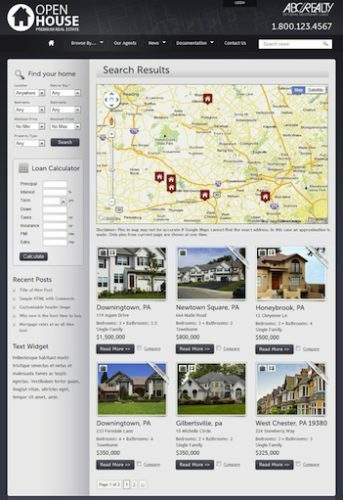 This is a great WordPress Theme to create your own Real Estate Website. Wordpress is the best way to create your own website. Wordpress is easy to install, easy to maintain, easy to create new properties, easy to install and activate a new WordPress Theme and you don’t need any programming knowledge. You can instantly transforming your Blog into a professional Real Estate Website with WordPress Theme – Openhouse. I highly recommend this WordPress theme if you want to create your own Real Estate Website. Create your own Business Directory Listing with WordPress and WordPress Theme – GeoCraft. This will cost you less than $200 to setup and you can create this yourself in a day. You do not need to hire a contractor to spend months on it, you can install this WordPress Theme and start your business today. Integrated into GeoCraft WordPress theme is Google Maps, Paypal payment system, GD Rating & Reviews and tons more. You can allow businesses to list their business for free or request a fee to list their sites with you. With GeoCraft, you can upload pictures, add business descriptions, google maps, contact information, business information and more. Click here to see more features of GeoCraft. You can create free/paid business listing. Completely integrated Google Maps System with each business listing on the basis of city. Lead capture for individual business owners. Easy Add Listing for business owners. Users review for different business. Home Page Click to action button for asking business owners to submit their own listing. Business Owners can easily register them self and submit their business listings. Related business listing at the end of each post. 1. $7/month for Webhosting which equals to $84/year. Also in order to create a Business Directory website, you must also have a domain name. That’s why I recommend Tigertech. Tigertech provides a free domain name, no setup fee, unlimited bandwidth, unlimited subdomains, free website stats, SSH and telnet access, 10 GB of space and tons more. Click here to see more details about Tigertech. 2. $0 for WordPress. Wordpress is completely free. Tigertech also provides 1 click installs for WordPress. You will have WordPress installed in minutes. 3. $97 for WordPress Theme. This is a one time fee to purchase GeoCraft from InkThemes. There are no hidden fees, no membership fees and no subscription fees. Once you purchase and download the theme it totally belongs to you. This is a great deal to create your own Business Directory website. You will have a powerful search function to search for business listings by location or keyword, you can also request payment for new businesses to add to your directory, Businesses can use Google maps to list their location, Businesses can add their hours of operation, businesses can list their social media affiliations, businesses can add company description. You can also list related businesses at the bottom. This is also a responsive theme so the screen size automatically adjusts to the device the user is using so this will maximize the users’ viewing experience. Overall this is an awesome theme to create your own Business Directory listing website. WordPress is the best way to make a website like Yelp, Citysearch, Qype or TripAdvisor. Wordpress coupled with this Premium WordPress theme GeoTheme allows you to transform your website into a fully functional city business directory complete with ratings, reviews, user contribution, price manager, coupon manager, event manager, restaurant manager and more. The cost to create a Ratings and review website with GeoTheme is less than $100 and you will see below from my cost breakdown that it is totally affordable. You also don’t need any programming knowledge. Click here to see more features of GeoTheme. 1. $56 for Webhosting. To create a website you will need a domain name. That’s why I recommend Fatcow.com web hosting. Fatcow.com offers a free domain name and web hosting with unlimited emails, unlimited MySQL databases, host unlimited domain names, unlimited bandwidth, unlimited space and more. Right now Fatcow.com has a %40 off sale. I would take advantage of this sale now. 2. $0 for WordPress. Wordpress is completely free. If you purchase Fatcow.com , there is a 1-click-install for WordPress. You will literally have WordPress up in minutes. 3. $85 for GeoTheme. This is the cost to purchase the premium WordPress theme Geotheme. After you purchase this theme it totally belongs to you and there are no subscription or hidden fees. Geotheme also provides you with 1 year free upgrades, 1 year support, and 2 free child themes. Click here to demo Geotheme. 4. -$175 in Advertising Credits. With Fatcow.com they also give you $150 worth of free advertising credits you can use to promote your website online. This includes $100 in Google Adwords, $25 in Yahoo/Bing Adcenter, $50 in Facebook ad credits. Startup costs + Free Advertising Credits = -$34. So basically you don’t pay anything to get your Yelp, Qype or CitySearch website started. This is a great deal and perfect way to start your online business. Click here for recommended Fatcow Webhosting. Users able to add reviews, ratings and comments. Frontpage slider can display Google maps or images. Display featured events or main attractions. 1. $56/year for Webhosting. You need to purchase a domain name and webhosting before you start. I recommend Fatcow.com because if you purchase web hosting from them, they give you a free domain name, unlimited disk space, unlimited email accounts, unlimited MYSQL databases, 24×7 support, and much more. The $56 includes their current 40% promo, I don’t know how long this deal will last. Click here to check it out. 2. $0 for WordPress. WordPress is completely free. It’s open source and you can play around or download wordpress from wordpress.org. 3. $89.95 for WordPress Theme. This is a one time fee to purchase the premium GeoPlaces template. Afterwards it is completely yours and there is no extra fee you need to pay to use it. After you upload and activate the template on your wordpress site, it is a fully functional Citysearch, Yelp or Restaurant Review website. This is the perfect Restaurant Review template as well. Check here for a demo/download the template. 4. -$150 Advertising Credits. If you purchase your webhosting through Fatcow.com you will get $150 in advertising credits. Fatcow.com gives you $75 in Google Adwords credits, $50 in Facebook ads credits, $25 in Yahoo/Bing advertising credits and it’s free to list your business on YP.com (Yellowpages). So that’s it. If you add in all the costs (Webhosting + WordPress + WordPress Theme) it totals $145.95. Please keep in mind that the prices are subject to change, especially the webhosting because it’s currently on sale right now. If you add in the advertising credits Fatcow.com gives you, you actually (Total cost + advertising credits) pay nothing to get your Yelp website started. This is the perfect WordPress Theme to build a website like Yelp, website like Citysearch, or any product/service review websites like Cnet.com or TripAdvisor.com. WordPress with Geo Places theme. WordPress is made for blogging, but it is a very powerful blogging platform. With WordPress you can create amazing websites with full functionality of exactly what you need. WordPress control panel is very easy to use. 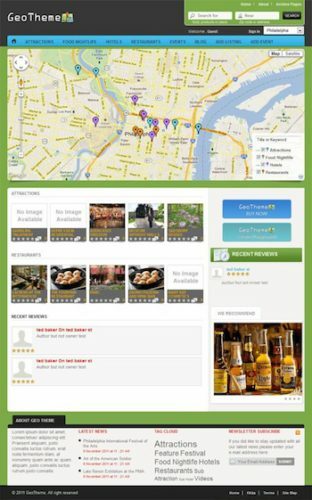 WordPress is free and I found a template that is perfect for a review site like Yelp called Geo Places by Templatic.com. Check out the details of the template here. 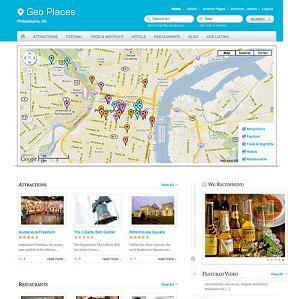 See above the screenshot of how Geo Places template will turn out on your website. Amazing right? The Geo Places WordPress theme will help you build a website like Yelp or Cnet with no coding required because with very little effort you have a fully functional review website that looks clean, simple, and easy to navigate. WordPress is easy to learn and the template is straight out of the box. You have all the plugins you need. After you install and activate your template, you are ready to dive in and start adding products, events, restaurants, hotels, shopping and allowing your readers to add ratings and reviews. There are many different options to create a review website like Yelp and these options can be used to build city review websites or a product or restaurant review website. I recommend using WordPress Template called GeoPlaces. Click here for more details. If you need help to install this theme, you can contact me for a quote. I will help you create a site like CitySearch.com, or a site like Yelp.com, or site like Toronto.com, or a Wedding event planning site, or a Wedding Bridal show site like the WeddingWire.com. Yes, if you think of the whole project from development to finish it will be hard, but using WordPress you can skip all the development work. You just need to add the content! So you ask, how to build a site like CitySearch.com? Easy, use WordPress. WordPress is free. After you install WordPress and connect with the right template for your event planning website, all you need to worry about is adding content. If you need help installing and setting up your wordpress site, see this post – and follow steps 1,2,3. Below I will introduce to you a template perfect for your event planning site. It will make your site look like a professional, clean, elegant, and most of all you don’t have to touch a single piece of code. The template name is Events by Templatic. Events by Templatic is SEO optimized, fully widgitized, banner ads optimized, comes with 4 different color schemes, has 6 built-in payment gateways, drop down menus, gravatar support and threaded comments, and so much more features that you have to demo to see for yourself. This is probably the best WordPress theme so far for event management or any of kind of event planning. With this theme, you can create an Event directory, event listings, add reviews and ratings, show locations through Google maps, add banners, or google adsense and these are just some benefits. Click here for a demo or download the Events template here. Visit Templatic.com to see other WordPress templates they have.